It looks like we should start planning certified robot Marco Rubio’s belated bar-mitzvah, because it looks like the GOP’s babiest automaton has turned into a real boy—at least when it comes to refusing to publicly back presumptive GOP nominee/withered Cheeto behind your couch Donald Trump. In an interview on Tuesday with anchor Jake Tapper on CNN’s The Lead, the former GOP hopeful and current Florida senator once again flatly denied the possibility of running on the same ticket as his former rival. “I stand by the things that I said,” Rubio went on to insist, while referring to Trump as an “erratic con-man” who should not be given nuclear codes—which is all probably correct, considering that Trump seems to think that nuclear warfare is about the same as playing Sid Meier’s Civilization II. While Rubio refused to give Trump an official endorsement, the senator also reiterated his investment in party unification, alluding to a pledge he signed earlier in the primary to support the eventual GOP nominee—whoever it turned out to be. 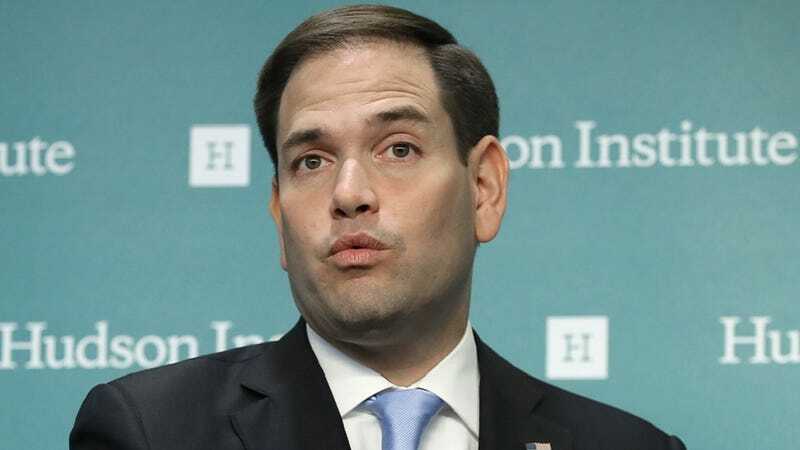 Even if we can all safely bet that Rubio will not serve as Trump’s running mate (or for that matter, befall the same fate as Chris Christie, who is probably a zombie at this point), it’s difficult to surmise whether Trump actually has an idea of who his VP will be, either. When asked at a press conference on Tuesday about how many people he is currently vetting for the slot, the GOP contender gave reporters his patented mix of infant babble and—well, infant babble.